The becquerel (English: /bɛkəˈrɛl/; symbol: Bq) is the SI derived unit of radioactivity. One becquerel is defined as the activity of a quantity of radioactive material in which one nucleus decays per second. The becquerel is therefore equivalent to an inverse second, s−1. The becquerel is named after Henri Becquerel, who shared a Nobel Prize in Physics with Pierre and Marie Curie in 1903 for their work in discovering radioactivity. As with every International System of Units (SI) unit named for a person, the first letter of its symbol is uppercase (Bq). However, when an SI unit is spelled out in English, it should always begin with a lowercase letter (becquerel)—except in a situation where any word in that position would be capitalized, such as at the beginning of a sentence or in material using title case. The gray (Gy) and the becquerel (Bq) were introduced in 1975. Between 1953 and 1975, absorbed dose was often measured in rads. Decay activity was measured in curies before 1946 and often in rutherfords between 1946 and 1975. Like any SI unit, Bq can be prefixed; commonly used multiples are kBq (kilobecquerel, 103 Bq), MBq (megabecquerel, 106 Bq, equivalent to 1 rutherford), GBq (gigabecquerel, 109 Bq), TBq (terabecquerel, 1012 Bq), and PBq (petabecquerel, 1015 Bq). For practical applications, 1 Bq is a small unit; therefore, the prefixes are common. For example, the roughly 0.0169 g of potassium-40 present in a typical human body produces approximately 4,400 disintegrations per second or 4.4 kBq of activity. The global inventory of carbon-14 is estimated to be 7018850000000000000♠8.5×1018 Bq (8.5 EBq, 8.5 exabecquerel). The nuclear explosion in Hiroshima (an explosion of 16 kt or 67 TJ) is estimated to have produced 7024800000000000000♠8×1024 Bq (8 YBq, 8 yottabecquerel). = 7023602214179000000♠6.02214179(30)×1023 mol−1, the Avogadro constant. of 7016402990552000000♠1.277×109 years = 7016403000000000000♠4.030×1016 s, and has an atomic mass of 39.964 g/mol, so the amount of radioactivity associated with a gram of potassium is 30 Bq. ^ "BIPM - Becquerel". BIPM. Retrieved 2012-10-24. ^ "SI Brochure: The International System of Units (SI)". SI Brochure (8 ed.). BIPM. 2014. ^ "BIPM - Table 3". BIPM. Retrieved 2015-07-19. (d) The hertz is used only for periodic phenomena, and the becquerel is used only for stochastic processes in activity referred to a radionuclide. ^ Harder, D (1976), "[The new radiologic units of measurement gray and becquerel (author's translation from the German original)]", Röntgen-Blätter, 29 (1): 49–52, PMID 1251122. 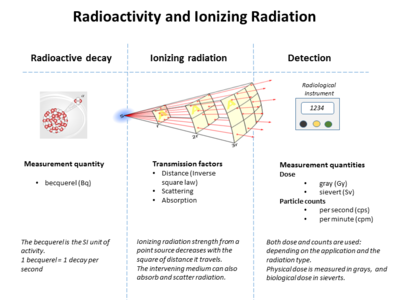 ^ Lind, SC (1946), "New units for the measurement of radioactivity", Science, 103 (2687): 761–762, Bibcode:1946Sci...103..761L, doi:10.1126/science.103.2687.761-a, PMID 17836457. ^ G.R. Choppin, J.O.Liljenzin, J. Rydberg, "Radiochemistry and Nuclear Chemistry", 3rd edition, Butterworth-Heinemann, 2002. ISBN 978-0-7506-7463-8. ^ Michael J. Kennish, Pollution Impacts on Marine Biotic Communities , CRC Press, 1998, p. 74. ISBN 978-0-8493-8428-8. ^ "Table of Isotopes decay data". Lund University. 1990-06-01. Retrieved 2014-01-12. ^ "Atomic Weights and Isotopic Compositions for All Elements". NIST. Retrieved 2014-01-12.